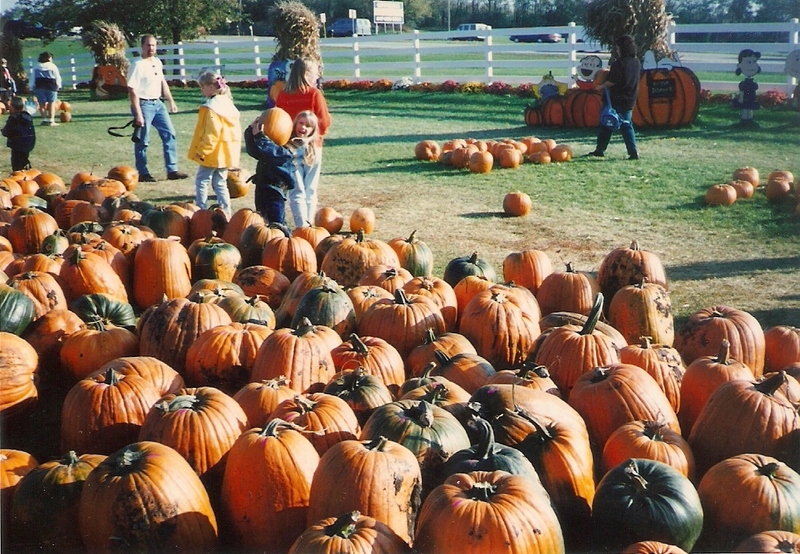 When I was a kid, my family would go to a pumpkin farm every fall to walk through corn mazes, eat elephant ears, go on camel rides, and of course, to pick out the perfect pumpkin. Yes, that’s me in the oversized jean jacket on the left. It was one of my favorite fall activities to run around a pumpkin farm with straw in my hair, a handful of animal feed, and a ticket for the haunted house. 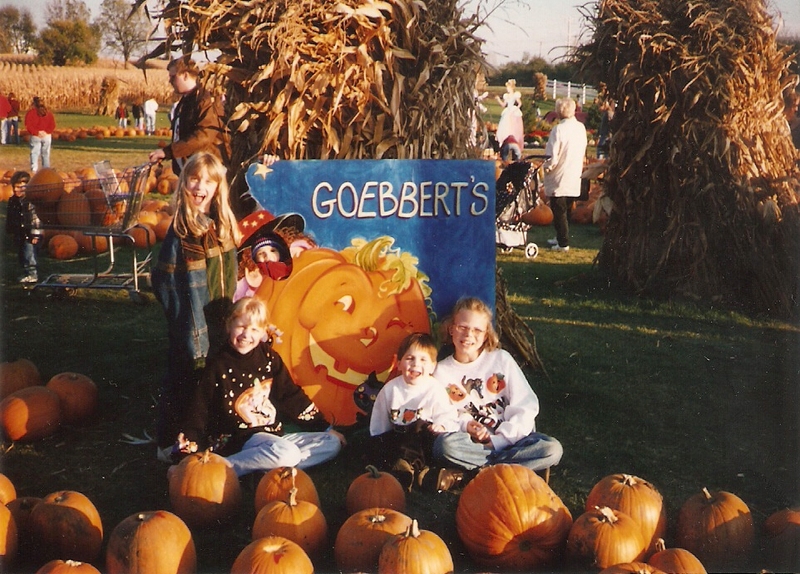 One that we frequented was Goebbert’s in Barrington, IL, which had always quenched our thirst for fall. So today my mom and I decided to recapture a bit of that old magic and go back to that same pumpkin farm. It was blazing hot, but that didn’t stop us. Things were a little different this time around: we didn’t do camel rides or wander through the kiddie haunted house, but we did get to enjoy some very autumn-filled festivities on what felt like a summer day. My secret is out: I was once a goofy-looking blonde kid. There were piles and piles of pumpkins everywhere, just as I remembered it, but we saved our pumpkin search for later. First we walked around and indulged ourselves in some cold apple cider and roasted sweet corn, which we could tell was fresh when we saw the corn fields surrounding us. There’s nothing like loading up roasted corn with butter, salt, and pepper on a beautiful fall day and devouring it like an animal. The fall shop there was perfect for people with a seasonal appetite: from scarecrows to a tiny Halloween town, there was plenty to explore. We set our sights on food in the end, getting some apple cider doughnuts and pumpkin butter. I’d never tried either of these things before, though it seems you can find them at any pumpkin farm or apple orchard in the fall. In any case, they’re both delicious. I think I’m falling in love. We also grabbed a big bag of kettle corn on the way out. 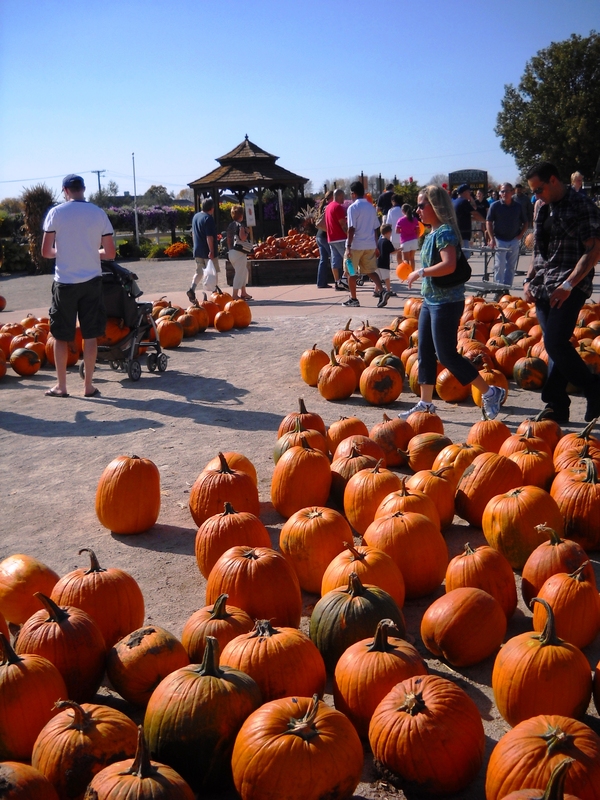 Finally, we scoured the patches for the pefect pumpkins, waiting to find the ones that called out to us. At last we found them, round and orange with long stems and not too much dirt on their skin. Loaded up with a medium sized pumpkin in one arm and a bag of goodies in the other, we made the long, hot, dusty trek back through the dirt parking lot to the edge of the corn field where we left the car. 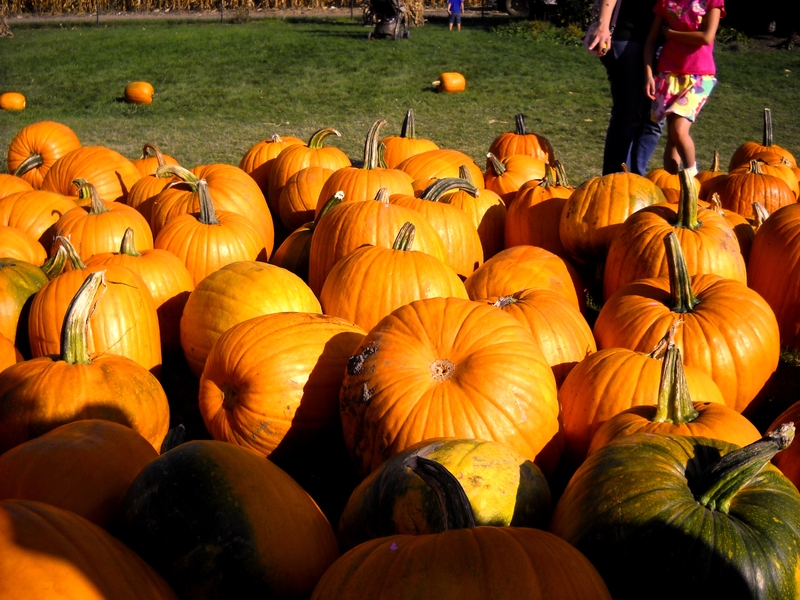 Even if you don’t have young children, pumpkin farms are a great place to go and enjoy the atmosphere, get some delicious treats, and find the pumpkin that will be grinning on your porch come Halloween. How was the pumpkin associated with Halloween? Who carved the first jack-O-lantern? Good questions! Maybe I’ll make a history of Halloween post about the origins of all this stuff.